Soothing blues in the spa's relaxation room. All photos courtesy of The Dorchester. LONDON – Blue lobster chowder, served in the beautifully revamped restaurant The Grill, which opened at The Dorchester Hotel as long ago as 1931. A gluten-free high tea, served with rare flavors from the Orient and champagne, in the Corridor, the hotel’s central axis where society types like to linger for an afternoon. A night relaxing in the most comfortable bed on earth, after an amusing rifle through the in-room gift boxes, selling £200 pajamas. The leafy views from my storied, old-world living room inside my spacious suite overlooking Hyde Park. The only thing that could possibly top all this was a visit to the last corner of the hotel I had left to explore, . 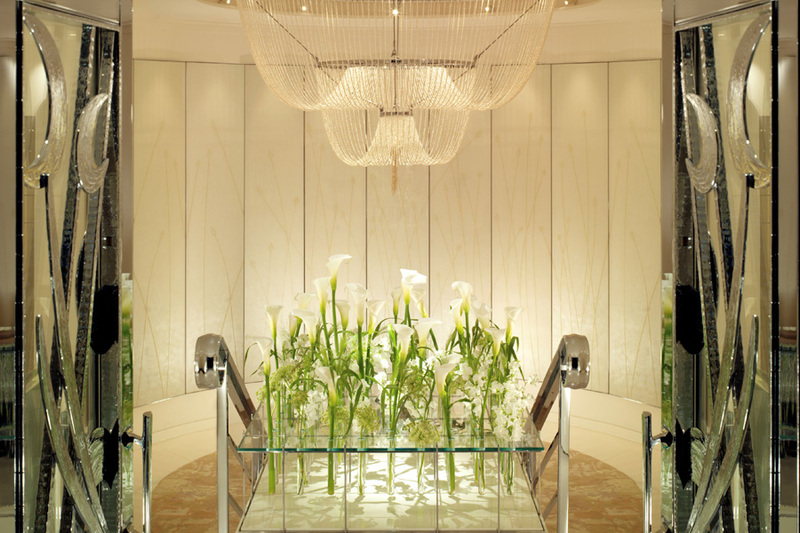 And so it was that I donned my white robe and stepped into the quaint elevator that swept me down — beyond gigantic flower displays in the lobby, past glass cabinets filled with bespoke men’s shoes — down to what is possibly be the most elegant spa in London. 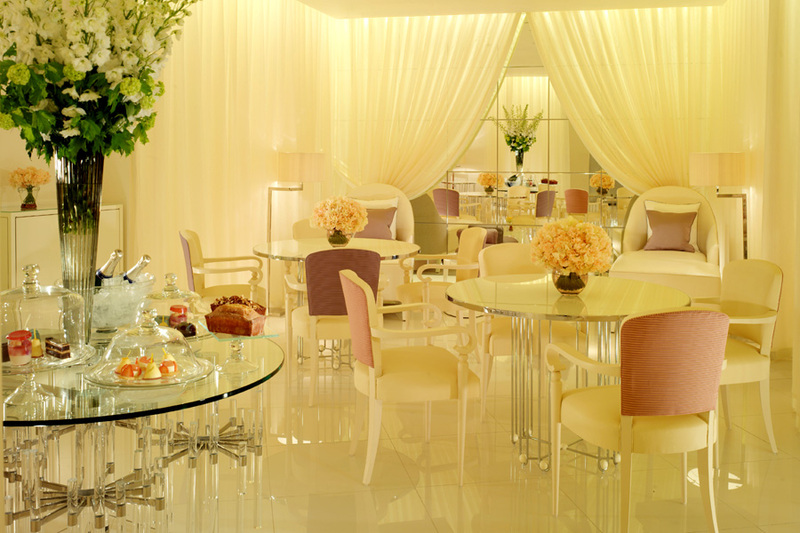 The Dorchester Spa is a true treat for the senses. Let’s start with the look of the place, because the spa combines outstanding design with a healthy menu that would be hard to rival in the capital and the toppest notch of top-notch treatments, including one of the best massages I have had this side of Los Angeles, where I spent a decade getting spoiled by spa treatments. What’s more, if you need time away from the nine million inhabitants milling about above ground, the spa is far from crowded, as I discovered when I visited a few months back, allowing me to feel both elegant (like the surroundings) and exclusive (like the other guests). Upon descending from the antiquated elevator, I was led past the peach curtains that concealed the spa dining area, the Spatisserie, into a changing room decorated in soft shades of marble and filled with every type of toiletry your heart might desire. Inside my locker, I found the requisite robe and slippers, as well as a gift box containing miniature Valmont creams in a cute take-home box. I ventured into the spa and spent a moment in a secluded seating area, amid cabinets of the La Prairie products they use for facial treatments, flipping through the menu of treatments from . Then it was time for the main attraction, the one-hour deep-tissue massage. I was lead to a treatment room and put into the hands of an excellent therapist who gave me a massage that anyone who does too much sport or has too tight muscles dreams of. It hit the spot and then some and was all the more enjoyable for the heated table and peaceful room. At £120, the massage is not cheap, but I have looked high and low in London for a good massage, and this is as good as it gets and worth every penny. After my massage, I was led into the striking Art Deco relaxation salon, with its velvet blue chaise lounges and sofas, fabulous photographs, newspapers and magazines, and selections of teas and complimentary fruits and nuts. This womb-like escape is a perfect setting to detox and unwind and forget everything that goes on outside these doors, not to mention inside one’s cell phone. After a cup of tea, I had a spot of lunch in the Spatisserie. I wandered in, clutching a copy of the Financial Times, and discovered the most delightful dining space. I sat back in a large white armchair around an elegantly decorated table in a room veiled in billowing curtains. It felt like sitting inside a Dior dress. The macrobiotic-inspired menu is a rarity in London. Brown rice is a staple in the lineup of West Coast-style sushi options. The Dorchester Spa proved hard to leave that afternoon, but I somehow pried myself away, wandering back along Park Lane as I slowly returned to the real world.